The HEF 32 UAV spent several days in a military EMI testing room and passed several militairy tests and is MIL-STD-461F-RS103 compliant. Multiple test set-ups were used to check the level of EMI shielding on the helicopter. During these tests, the HEF 32 was exposed to field strengths of 200 V/m in the 1-30 MHz and 1-18 GHz frequency bands. 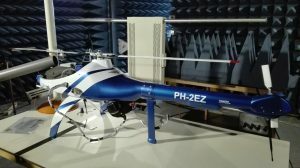 The results of these tests were very positive and we are happy to announce that the HEF 32 unmanned helicopter system is now MIL-STD-461F-RS103 compliant.